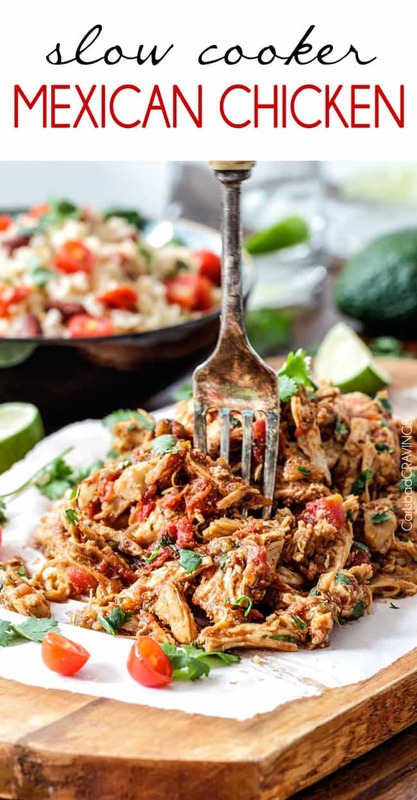 Easy Slow Cooker Shredded Mexican Chicken simmered with Mexican spices, salsa and green chilies for amazingly flavorful chicken for tacos, burritos, nachos, soups, salads, etc. and all you do is dump and run! You NEED this in your back pocket! Need is a strong word. 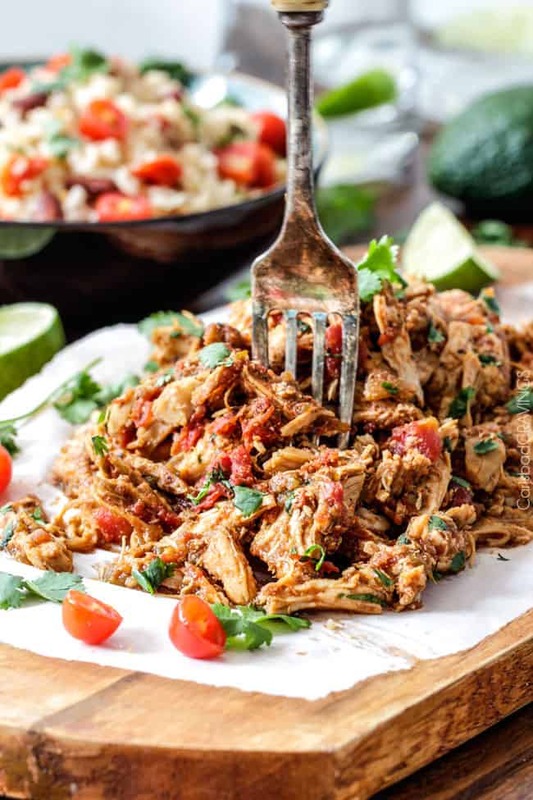 But when it comes to food and recipes, I am convinced you NEED this go-to, easy, crazy delicious Slow Cooker Shredded Mexican Chicken at your fingertips. 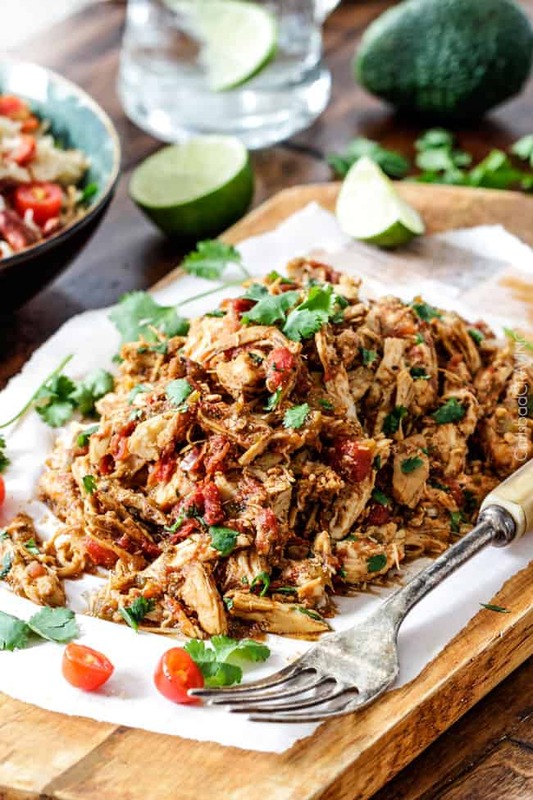 In fact, it is the only all purpose, Slow Cooker Shredded Mexican Chicken you will ever need! 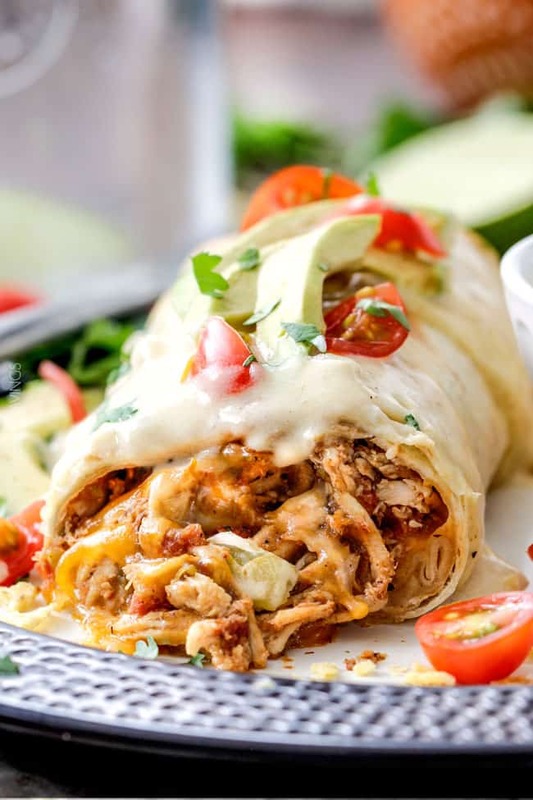 It joins the cast of my other stellar back-pocket Mexican staples of Tacos Al Pastor, Carne Asada, Slow Cooker Pork Carnitas, Baja Fish Tacos, Beef, Bean and Cheese Burritos, Chicken Fajitas, Steak Fajitas, Green Chile Chicken Enchiladas and Slow Cooker Barbacoa Beef. And of course, every one needs a killer Chicken Tortilla Soup recipe. After all, tacos, burritos, nachos, tostadas, chimichangas, enchiladas, etc. are only as good as the meat and this Mexican Chicken is stellar. It will be the star of your Mexican dishes and bonus! – it is super easy and fabulous for make-ahead or even freeze-ahead meals. Use the chicken plain in your recipes or top them all off with Homemade Salsa, Salsa Verde or Pico de Gallo for an added layer of YUM! 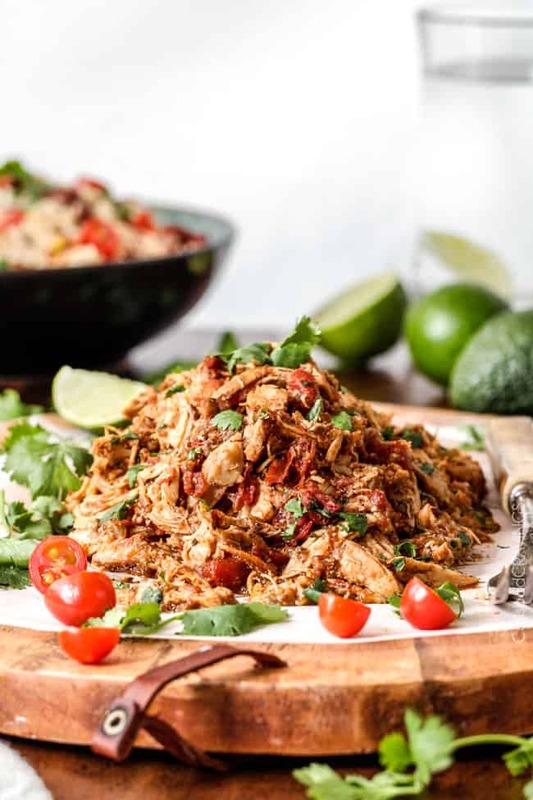 The perfectly flavored chicken cooks in a Mexican spiced bath of salsa, green chilies, diced tomatoes, brown sugar and a splash of liquid smoke. The chicken cooks until its fork tender, then shredded and added back to the seasoned juices to re-absorb the flavor in every crevice. At this point, you drain any excess liquid. I like to save the seasoned liquid to cook my rice in like I first did in my Slow Cooker Fajita Chicken – so good – some of the best rice you will ever eat! The chicken is perfect as is for tacos/burritos or if you are serving plain over rice, I love to stir in some enchilada sauce. 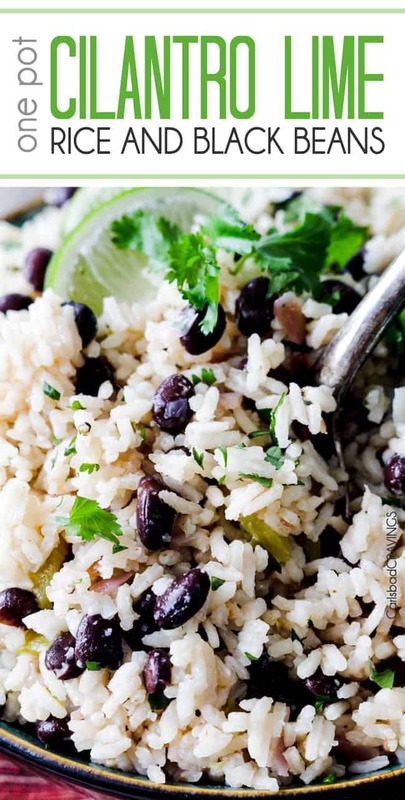 It is also fabulous with Restaurant Style Mexican Rice or Cilantro Lime Rice with Black Beans. 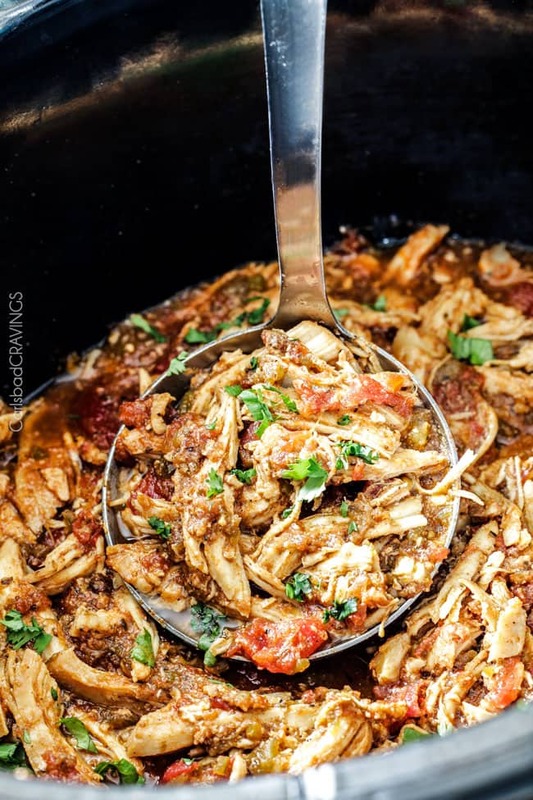 Looking for more crockpot shredded chicken recipes? 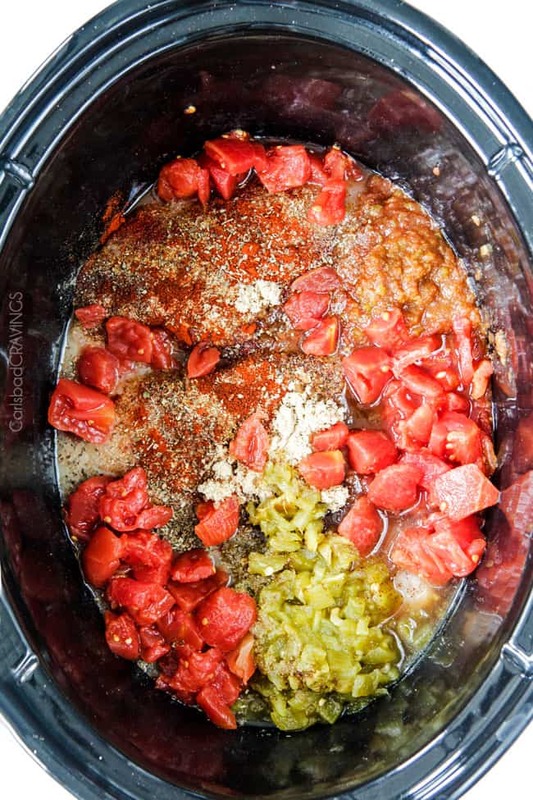 Rub chicken breasts with oil and place in the bottom of your slow cooker. Add all of the remaining ingredients except for the hot sauce. Cook on high for 2-4 hours or on low for 6-7 hours or until chicken is tender enough to shred. Remove chicken to a cutting board, and let rest 5 minutes before shredding (there will be liquid remaining). 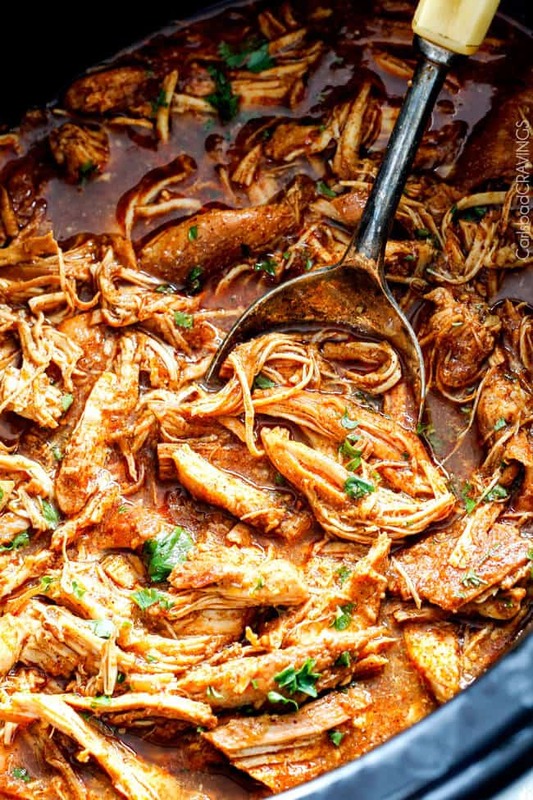 Return shredded chicken and let cook on low for an additional 20 minutes to absorb some of the liquid/juices. Drain all excess liquid (see note***). Taste and add hot sauce to taste if desired. *Liquid Smoke is found next to the BBQ sauces in any grocery store and adds a wonderfully smokey flavor. ***Use 3 tablespoons brown sugar if using mild salsa and not using ground chipotle chili pepper. Use 4 tablespoons if you are using medium salsa and/or the ground chipotle chili pepper. The brown sugar balances out the heat. I use both medium salsa and the chipotle chili pepper and it has a kick but not overly spicy in my opinion - perfect to be smothered in cheese. I had a comment that the chicken is not spicy at all if you leave out the chipotle pepper - perfect for kids. 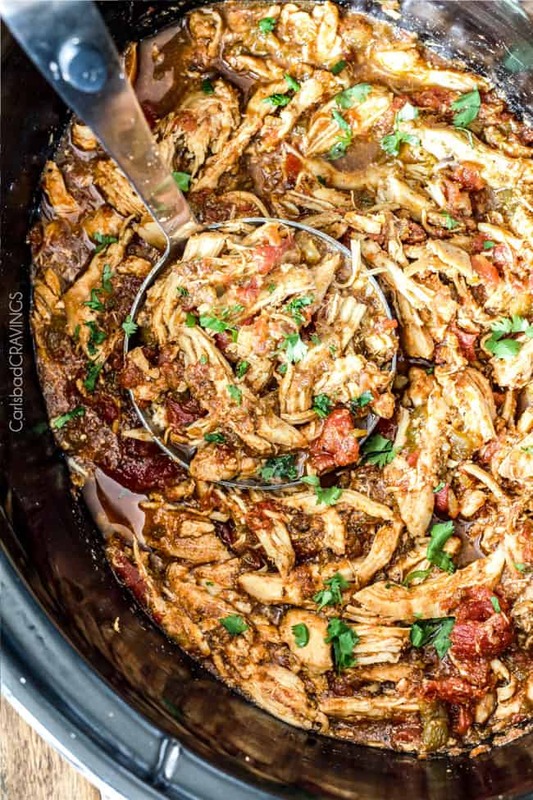 ***When I drain my excess liquid, I top a large bowl with a strainer and add slow cooker contents, pressing down on chicken to get rid of all of the excess moisture. I then use drained liquid plus additional needed water to cook my rice for AMAZING flavored rice. ***If serving over rice, try stirring in some enchilada sauce after you drain your chicken for some saucy Enchilada Mexican Chicken. I have to tell you what a hit this was at our family reunion at the beach recently. We had 22 hungry mouths to feed for a week and this chicken was a featured part of Taco Night along with all the fixings, of course. It’s so easy and moist and versatile. We are from west Texas and it’s truly a validation that everyone loved it so much! 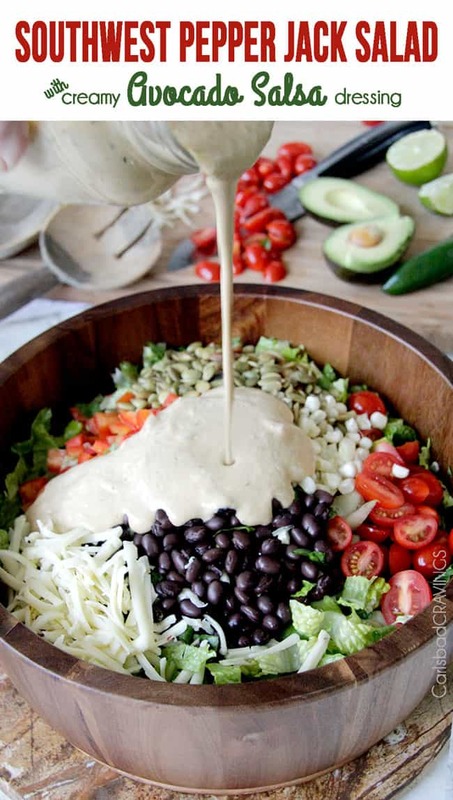 I love the idea of serving this Mexican Chicken at a family reunion with all the toppings! That is awesome it was such a hit, even with Texans who know their Mexican Food! thank you so much for taking the time to comment and make my day! I’ve made this recipe multiple times and it is SOOOOO good whether in lettuce wraps, tacos, or other mexican dishes! Must try. Thank you, Jen!! You are so welcome! I’m thrilled it is such a favorite! Thanks for the recommendation! You are so welcome Julia! That is amazing that even the chicken HATER loved this Mexican Chicken! That makes me so happy! And bravo for your clean eating! Thank you for taking the time to comment and make my day! For the hot sauce do you mean like Tabasco or like Ortega? Thanks so much!! I would use whatever your favorite hot sauce is – totally personal preference. Enjoy! I’m a college student with just enough money to survive til the end of next semester. I’ll make this in pretty big batches and let it cook while I’m at classes. It’s not a lot of work, costs $10 for like 8 meals which is incredible, and is consistently the best meal I’ve had all semester. This will definitely be a reoccurring dish! Hi Adam, thank you so much for taking the time to comment! I’m so pleased this Mexican Chicken is a delicious economical solution to get you to the end of the semester! Stay at home mom here with a hungry husband and 4 kids. Of all of the crock pot recipes I have made over the years, this is BY FAR the VERY best. Hands down. We could all eat this EVERY SINGLE DAY OF OUR LIVES. Wow Kori, thank you SO much for the ultimate compliment! I am honored this Mexican Chicken is the best crockpot meal you’ve ever had! Is there another way I make thii without a slow cooker? Hi Nikita, yes, you can cook the chicken in a large saucepan/Dutch oven on the stove and simmer, covered on medium low for 40 – 50 minutes, turning chicken occasionally until the chicken easily shreds with a fork. enjoy! Excited to try this recipe!! Has anyone tried cooking the chicken in an insta pot or a presssure cooker to cut down on the time?? I did last night! Turned out amazing and put it on nachos. I did, last night! Turned out amazing and put it on nachos. This is such a versatile, delicious recipe! The blend of seasonings gives the chicken such a rich depth of flavor. 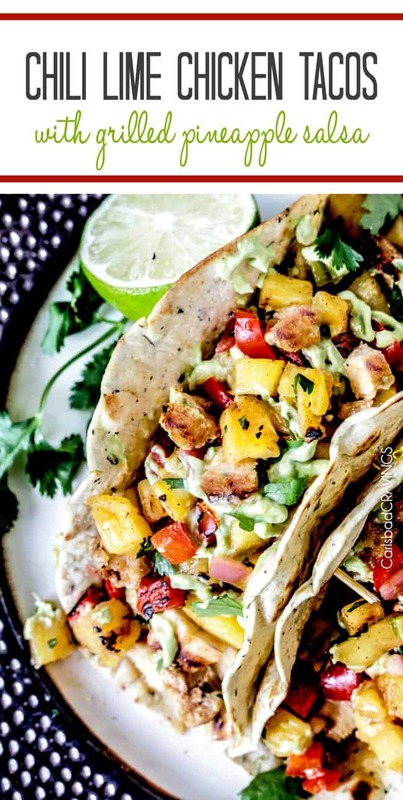 We’ve used the chicken in taco bowls, burritos, tacos, and quesadillas. This is definitely a meal planning staple at our house! I love hearing this is a family favorite Diana, thank you so much! Love this chicken and as a single person I love that it freezes so well! Quick question, have you made it in the instapot yet? Would love help making it in that for ease after work. I’m so happy you love this Mexican Chicken! I am sure you can make it in the instapot but I am not an expert yet – I’ll post directions as soon as I do it! This was soooo good. I added corn and served it over rice. Thanks for sharing! You are so welcome Sally, I’m so happy you loved it! Sounds perfect with the addition of corn! Love this recipe!! I have made it several times…would love to see if anyone has adapted it to a pressure cooker or instapot cooking method..? This is my go to recipe for making chicken tacos. My lfamily begs me to make it! It seriously is fantastic and so easy and versatile. Thanks for sharing! You’re so welcome Michelle, I’m so pleased it’s a family favorite!